Meet data security obligations by easily enforcing encryption policies while keeping productivity high. Companies large and small benefit with low help-desk overhead and short deployment cycles. No other product can match ESET Endpoint Encryption for flexibility and ease of use. The client side requires minimal user interaction, improving compliance and the security of your company data from a single MSI package. The server side makes it easy to manage users and workstations and extend the protection of your company beyond the perimeter of your network. Do you do business in the European Union? The EU's General Data Protection Regulation (GDPR) comes into force in May 2018, and introduces significant new penalties for organizations that fail to protect their users' data adequately. One proven solution for data protection is encryption. ESET Endpoint Encryption makes encryption of data on hard drives, portable devices and sent via email easy, helping you comply with the GDPR. 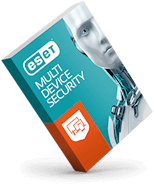 ESET offers online resources, webinars and a compliance checker that you can access for free. ESET's GDPR guide explains key points of the new law, and how to begin preparing now. Data is a critical part of every organization, but this most valuable asset often poses a huge risk when it travels or is transmitted beyond the corporate network. Meet your data security compliance obligations with a single MSI package. Deployment flexibility painlessly extends encryption security to mobile/home users. The server can manage users and workstations independently or in many-to-many relationships. A single install serves all four license types. Upgrading and renewing requires no reinstall and is as simple as entering an activation code. As a service provider and working to service-level agreements, it is reassuring that we can recommend, procure, commission and support an encryption solution which helps keep continuity across Staffordshire educational establishments, reducing overall costs. The pilot was set up in a real time environment and we found the solution be extremely user-friendly, with its web-based interface. The Enterprise Server was very good, even allowing control of devices over the internet, independent of network or directory structure. For schools, the secure management of sensitive personal data is a big issue and several schools and local authorities have been fined for losing unencrypted laptops and memory sticks. It was important to Dudley schools that we conformed to the recommendations, and were seen to treat our data seriously. We are a charity and most charities don't have IT departments, they just need a product that works, and ESET works for us. Please note that ESET Endpoint Encryption uses the engine of DESlock Encyption. Parts of the product, including the installer and product interface, may feature "DESlock" naming. © 1992 - 2017 ESET, spol. s r.o. - All rights reserved. Trademarks used therein are trademarks or registered trademarks of ESET, spol. s r.o. or ESET North America. All other names and brands are registered trademarks of their respective companies.